“Our Food, Our Right” on Sale Now! These make GREAT gifts! Order yours now! 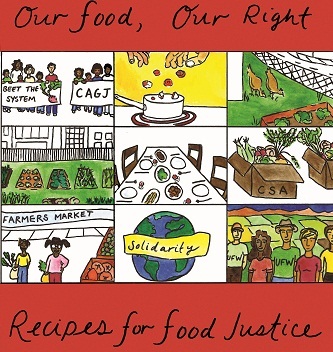 Our Food, Our Right: Recipes for Food Justice is a new CAGJ Food Justice Project publication (72 pages) that combines hands-on tools for change with community recipes and political awareness to engage YOU in joining in the struggle for food justice! Our Food, Our Right promotes community knowledge sharing, self-sufficiency, accessibility, and food justice through a food sovereignty framework. Our Food, Our Right takes you on a journey through many of the current food system’s failures, and showcases creative solutions that communities are designing to regain control over their food, and the health of their bodies and neighborhoods. This guide has the tools you need to take back your food choices and stand up for all people’s right to good, healthy, and culturally appropriate food! Local community resources for getting involved in strengthening local food economies, everywhere! …..and MUCH more! Also features illustrations and design by local artists! In an effort to make this guide as accessible as possible, we are offering Our Food, Our Right for $5 – $20, sliding scale donation! Bulk discount: Buy 5 for $50! The guide is valued at $15; if you are able to pay $20 or more, you help us subsidize 100 free copies that will be distributed to local food justice organizations serving disadvantaged communities, as well as food banks, shelters, and community centers. How can you get Our Food, Our Right?